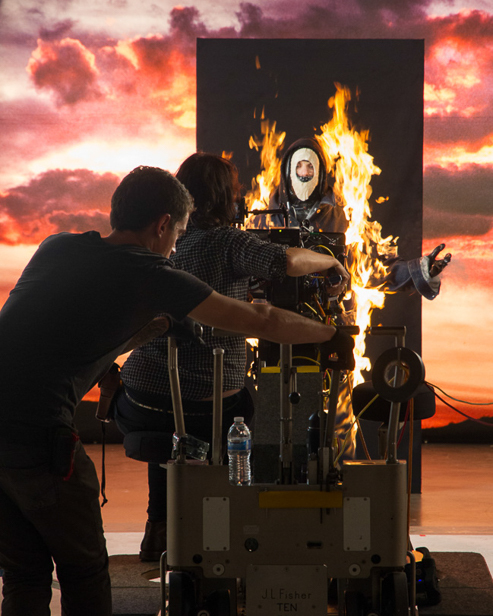 Inextinguishable Fire enacts a full-body burn on film and in front of a live audience. Inextinguishable Fire engages spectators with the construction of images of violence and war in the media. Presented as both a live performance and a video, it juxtaposes the immediacy, urgency and ephemerality of live performance against constructed acts for camera in order to challenge the documentary truth factor of images. Inextinguishable Fire is a performance for the camera featuring Cassils engaged in a treacherous fire stunt. Using techniques borrowed from Hollywood stunts, Cassils experiences the very real human terror of being lit on fire. 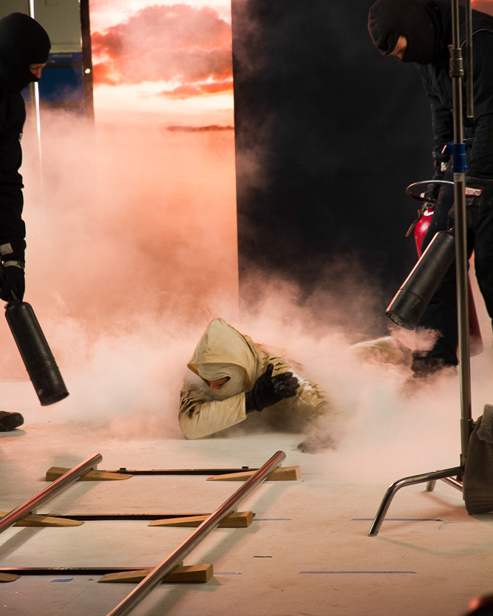 Using a Phantom camera that shoots at 1000 frames per second, the 14-second full body burn is extended to 14 minutes of slow motion flame. The title of the piece references Harun Farocki’s 1969 film of the same name, which approaches the impossible task of effectively depicting the horror of napalm on film. Cassils’s gesture of self-immolation speaks to both the desire for and the impossibility of knowing such horror even while decisively aiming to approach it. Though the stunt is a simulation of violence it still presents real danger. This possibly volatile situation (and the attempt to control it) is captured to create an image where danger, empathy for those experiencing violence and the privilege of removal from such circumstance operate simultaneously in one transparent performance. Slowing the burn down required the viewer to spend time in a world reduced to the fleeting headlines of Twitter and Facebook feeds. When screened on a continuous loop, the video references continuous cycles of political uprising and apathy, life and death, ignition and extinguishment. The title of the work references Harun Farocki’s eponymous 1969 film, which reflects on the impossibility of effectively representing the horror of napalm on film. Inextinguishable Fire had its US premiere at the Sundance International Film Festival. 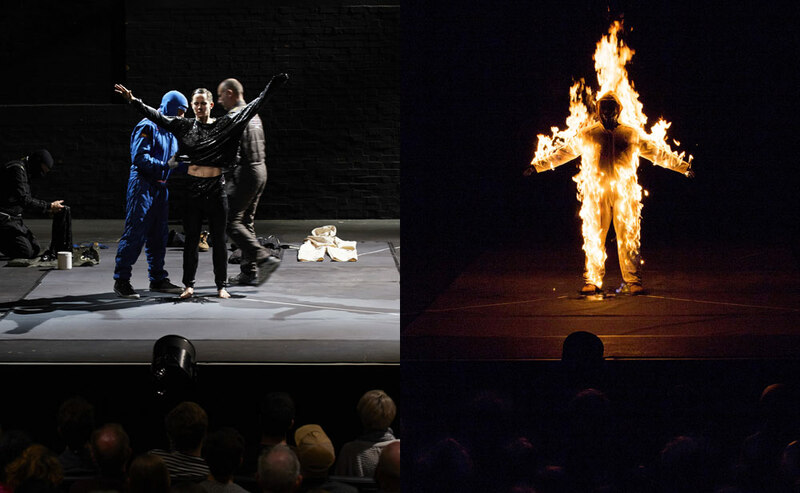 Inextinguishable Fire was performed live at the National Theatre in London on April 2, 2015, as part of the SPILL Festival of Performance. As the performance began, the artist stood silently on stage, clothed only in a pair of briefs. They made eye contact with members of the audience as they assumed their seats in the theatre. The mood was tense; the aesthetic was stark. The house lights were on, and the stage appeared to be in-between productions with exposed wires and cords visibly dangling from the rafters. When the majority of the audience had been seated, a stunt team entered the stage and began to prepare Cassils for the “full body burn,” a treacherous fire stunt borrowed from Hollywood productions. For nearly twenty minutes, they laboriously coated the artist’s body in layers of fire resistant long underwear soaked in a freezing solution intended to induce a hypothermic state. 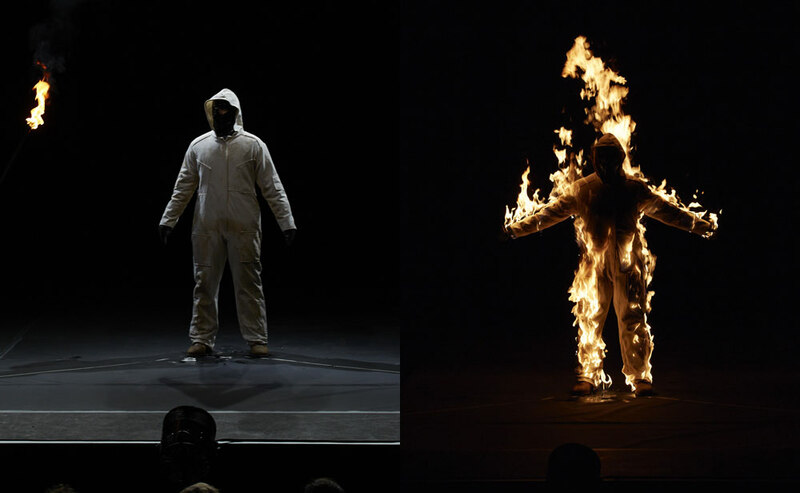 The risk in performing a fire stunt is not that the fire will touch the skin but that perspiration from the heat of the body will boil and burn the skin inside of the protective garments. For this reason, Cassils was chilled to the bone before they were light ablaze. In the video of the performance, a single shot slowly and steadily zooming outward to reveal this process of preparation to the viewer. In the live performance, strategically placed microphones gradually amplified the sounds generated by the on-stage stunt preparation to focus the viewer’s attention. Tension increased as the viewers began to hear the stunt coordinator whisper to the artist, the application of viscous protective fabric across the skin, a jaw shuttering with cold. A sonic drone, barely audible, fluctuated in the live sound design by Kadet Kuhne. Next the audience was guided to a well-traversed public walkway outside of the theatre where they watched a large-scale video version of Inextinguishable Fire projected on the side of the Southbank Centre building. In contrast to their experience in the theatre – where audience members reported feeling “anxious,” “on edge,” and “ready to vomit” – they witnessed the same event as a mediated spectacle with a public bustling by without concern for the burning body.